These Marc Fisher wedges are amazing dupes for these $700 Chloé wedges and they are so comfortable right out of the box. I had a few Nordstrom vouchers saved up and I'm so glad I cashed them in on these. 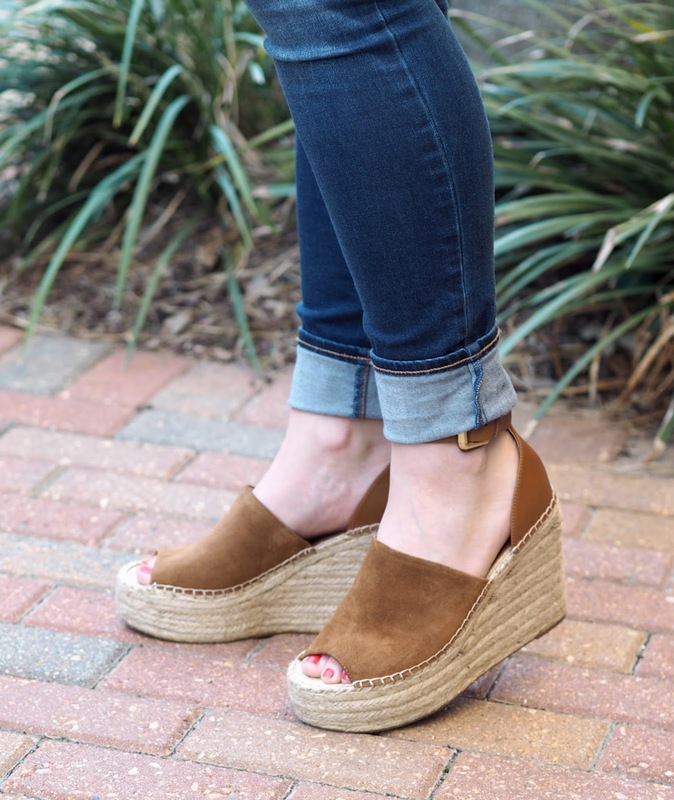 I've seen them on everyone and their mom, but it's totally okay because they are the perfect wedges to transition from winter into spring. They have a suede upper, which makes them feel a bit more wintry, despite the open toe. The platform and straw bottom make them super comfortable though, and I love pairing them with jeans and a simple top now, or a springy dress later. My top is a purchase from Banana Republic last year (similar here), but I've linked tons of great springy tops below. I love this Madewell one with the ties on the sleeves, this fluttery sleeve one that is so great to go from a work day to a night out, and this cotton candy pink off the shoulder top WITH a bow! 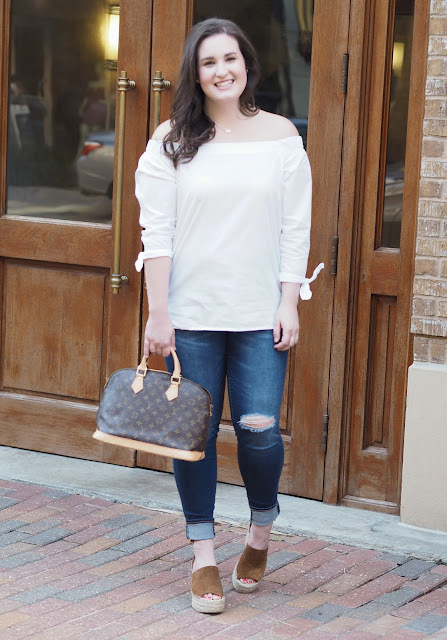 Bows, ruffles, off the shoulder, and bell sleeves are going to be huge well into the fall this year, and they will easily transition from season to season depending on what bottom you pair them with, so I highly recommend picking up a few. 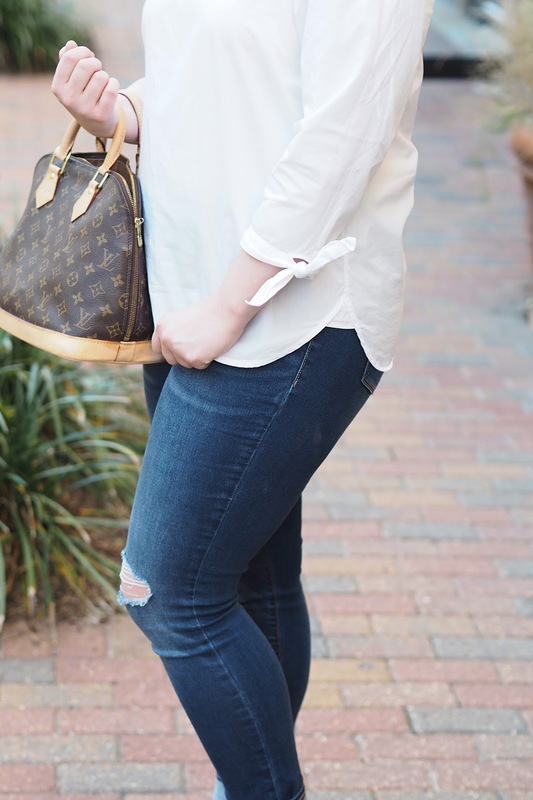 I love pairing simple but classic tops with my favorite Old Navy jeans (last seen here) lately. It looks nicely put together, but these are the comfiest "stretchy but never stretch out" pair.